Don’t waste valuable time prepping the wrong way for a meeting. Use the meeting agenda template to outline everything for your fellow co-workers so there are no surprises, hiccups or other issues. This incredible, easy-to-use Microsoft Word template is completely complimentary. There are also no restrictions on the amount you can download, so feel free to click the mouse as many times and as often as you need. 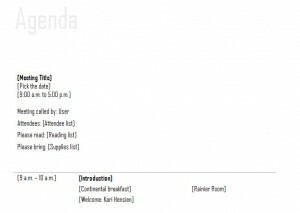 This meeting agenda template will truly rock your world. The header of the Microsoft Word document says “agenda.” However, this can be completely customized to your needs, meaning you could change it to read the name of your business or company, the day and/or date of the meeting, or where the meeting is located. The next section is reserved for the bulk of the pertinent information pertaining to the meeting. Here, you will list the title of the meeting, the date of the meeting and how long the meeting will last. Just below you will list who the meeting was called by, who will be attending the meeting, what you need to know for the meeting and what you may or may not need to bring to the meeting. Now it’s time to get down to the nitty-gritty of the meeting agenda template. In the body section, you will list when a portion of the meeting will take place (in hours or minutes), what is on the agenda during this time frame and where the event will be located. This process can be repeated as often or as little as you need. It’s designed for a total of four events during the course of a meeting. The final section of the meeting agenda template is reserved for inputting any additional information, such as instructions, comments or directions. This section, like any other on the template, can be completely removed if you have no use for it. The template is customizable and designed so that it can meet all of your meeting needs. This fantastic meeting agenda template is just one of the hundreds of amazing and helpful Microsoft Word business templates, calculators and tools available at absolutely no charge on this site.